The UT campus has a pleasant environment that invites students, staff, faculty, and visitors to walk throughout our campus. The University Master Plan and the Campus Transportation Study both recognized the importance of pedestrian movement on campus. As a result there have been several recent changes in the campus to improve pedestrian movement, and there will be more during the next few years. Pedestrian movement on campus will be integrated with a review and analysis of the campus outside lighting program, emergency call boxes, and a wayfinding system. The easiest way to access campus and the surrounding area is often by foot, and there's NO PERMIT required! Pedestrians, bicycles, and vehicles must obey all traffic control devices. Pedestrians have the right-of-way at marked crosswalks, in intersections, and on sidewalks extending across a service drive, building entrance, or driveway. Pedestrians should not leave the curb or their place of safety and walk or run into the path of a vehicle that is so close that it is impossible for the driver to yield. Pedestrians may cross an intersection diagonally where permitted by special pavement marking. Pedestrians crossing a street at any point other than within a marked crosswalk at an intersection should yield the right-of-way to all vehicles. Monday-Sunday 8 p.m. - 2 a.m. 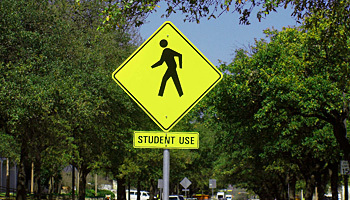 If you are on campus late and have concerns about your safety getting home, all students, faculty, and staff can request SURE Walkers to accompany them. Two SURE Walkers may accompany you on your walk home or provide a complimentary cart or car ride, depending on service area.